A few years ago, if you asked me what SEO came down to, I would have said two things: keywords and inbound links. Keywords placed properly in your content boosted your site's relevancy to a given search, and inbound links from other sites acted as a vote of confidence for your site's authority on the search topic. The deconstruction of search engine rank into those two main components made SEO more approachable to marketers of all company sizes. (Incidentally, it also led to nefarious practices of keyword stuffing, link planting, and more than a little gaming of the Google system). Over the years, with updates like Panda and Penguin, Google has made some changes targeted at countering black-hat SEO. Changes to its algorithm in recent months, though, have taken on a different nature and seem to indicate a more momentous shift in search as a whole. While keywords and inbound links will always be important, as we examine these recent trends, it seems as though in the future, they won't stand alone as primary factors in your website's search rank. If history has shown us anything, it's that sometimes, things don't just turn out as you thought, and the world spins on. But the biggest reason I'm pretty confident in these? In the words of science fiction writer William Gibson: "The future is already here -- it's just not evenly distributed yet." Below are a few early signs of how we can expect SEO to evolve in the coming years. 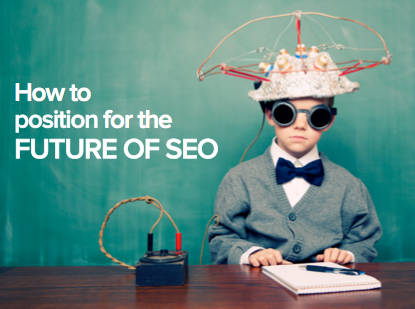 You can also check out my thoughts on the future of SEO in this SlideShare! According to Google, 61% of mobile searchers who land on non-optimized site will immediately leave the site and return to Google to find one that is more readable. "Smartphone users are a significant and fast-growing segment of internet users, and at Google, we want them to experience the full richness of the web," explained Yoshikiyo Kato, software engineer at Google. For that reason, changes went into effect this summer that will start to prioritize mobile-optimized sites on search results for users on such devices. Of course, this means the inverse will also occur: Sites that might otherwise have ranked highly based on keywords and inbound links will be demoted in search rank if they're not properly optimized for mobile. So how do you position yourself for this evolution? 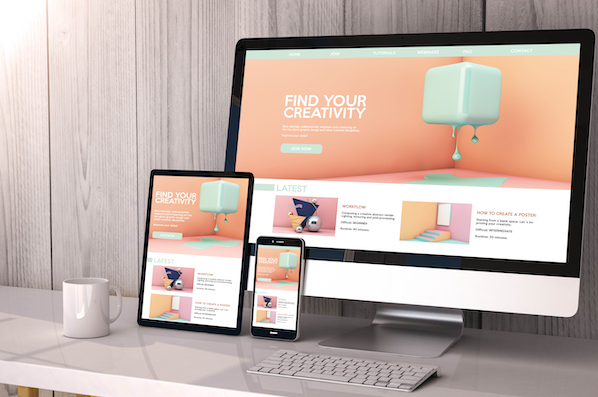 Google recommends building your website using responsive design for your next website redesign. Responsive design is an approach which automatically repackages website content to fit the device viewing it. (HubSpot uses responsive design for our website, landing page, and blog software). Separate mobile sites are also acceptable but have to be set up properly. 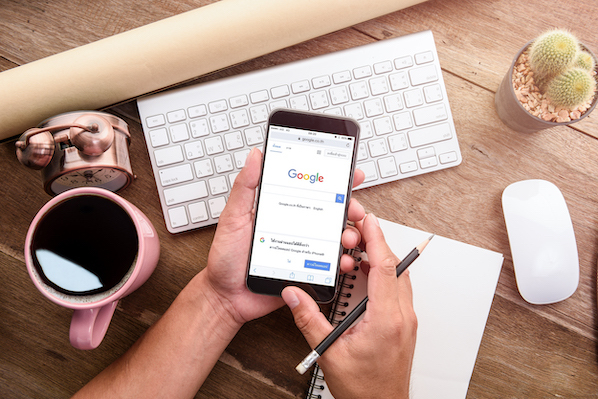 Google will penalize separate mobile sites that redirect searchers to a mobile homepage if their desired search result directed them to a sub-page. Therefore, the next time you redesign you website or blog, make sure that responsive design and mobile search are part of the discussion. When I first learned SEO, the only way to increase your search authority was to write the sort of content that was so good it got picked up and linked to by other websites. In fact, earning inbound links was one of the core tenets of inbound marketing. And that hasn't changed, but the definition of what makes a good inbound link is starting to. Let me explain. A few years ago, the best inbound link you could get was from a site with a lot of authority itself. A link from the Wall Street Journal or a government website, for example, was of incredibly high value. That value hasn't changed, but there are other ways now to achieve an authoritative link. Social media has enabled people to get content and product suggestions directly from friends and, according to Nielsen Research, 92% of consumers worldwide trust recommendations from friends and family more completely. Search engines, as a result, have begun to shift to factor a searcher's social connections into their results. Here's Google's explanation of how they do it. December 2010: "Google and Bing Confirm that Facebook and Twitter Influence SEO." June 2011: Google announced support of the authorship tag (Rel="author") to connect authors to their content (and Google+ accounts) across the web. 2013: Studies from Moz and Search Metrics find high correlations between search results and social shares (particularly Google +1s). Google's Matt Cutts is very clear to underscore that correlation does not equal causation, but in this case, correlation might be enough. Sites with a lot of social shares also tend to be sites with high search rankings, and that's because they're an indicator of the virality and number of inbound links generated by the content. The good news about this change is -- even as social continues to grow as an influence SEO -- your existing social media strategy should naturally work with the change to position your posts to do well. If you're concerned about your social search optimization, here's a post with a more in-depth explanation and action steps you can take to position yourself well. Traditional SEO has been all about keywords. In fact, we've always recommended frontloading your titles and URLs with the keywords used in your content. This fall, however, Google introduced its Hummingbird algorithm, its first major algorithm update since the 2009 "Caffeine" update and a significant shift in Google's approach. 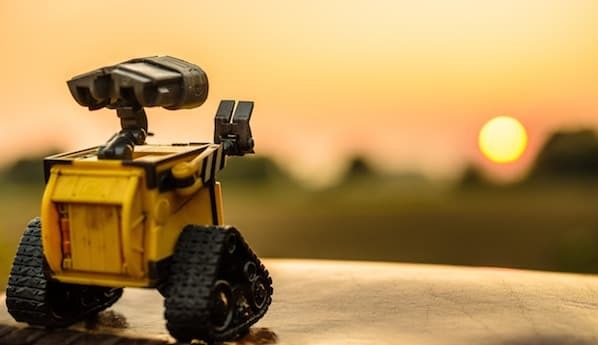 "The main focus was that the new algorithm allows Google to more quickly parse full questions (as opposed to parsing searches word-by-word), and to identify and rank answers to those questions from the content they’ve indexed." This means searches like "What's the best reviewed contractor near my home?" will factor in the full statement and pull from reviews and maps in addition to just keywords. This shift is the result of changing user behavior. Over the years, searchers have started to type questions directly into Google rather than search terms. 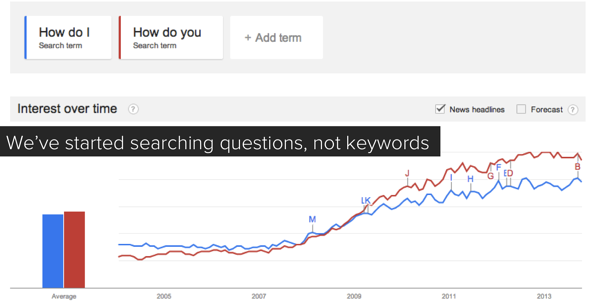 Here's a screenshot of the rise in popularity of the search terms "How do I" and "How do you" over the last few years. In the future, I expect the role of natural or conversational language to play an even bigger part in search engine optimization. This move toward search intent is actually a really good thing for inbound marketers whose core strategy involves creating useful content aimed at answering user questions. Instead of thinking about keywords, think about the questions someone would ask to find your company online and create content around that. In addition to understanding intent, search engines are also getting better at understanding the context under which you are conducting the search. Nowhere is this more evident than in the spread of localized search and the early use of Google Now. As a result, Google and other search engines have made it easier to find local information. 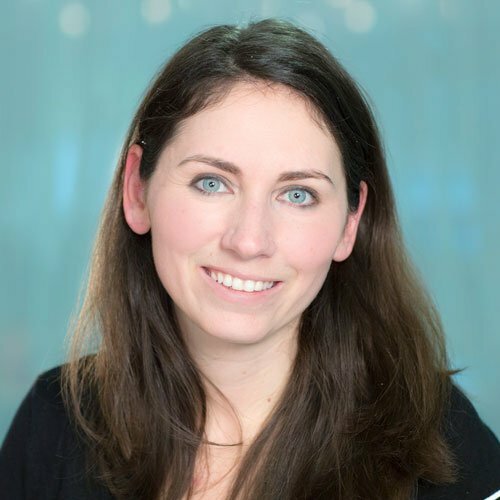 Back in August, my colleague Rebecca Churt published this really helpful piece on how to dominate local search. Chief among her recommendations was to go create a Google+ account for your business. In addition, you can check how you are listed across different local listings at getlisted.org -- a free service from Moz. Google Now is even more fascinating, as it integrates a number of elements to better understand and respond to the context of a given search. Wikipedia explains it well: "Google Now uses a natural language user interface to answer questions, make recommendations, and perform actions by delegating requests to a set of web services. Along with answering user-initiated queries, Google Now passively delivers information to the user that it predicts they will want, based on their search habits." So, as you're headed to the airport, Google Now will tell you things like travel time and good restaurants at your destination. The implications for brick-and-mortar businesses are significant, but even online businesses will see an individual's context play a bigger role in user-initiated inquiries. What does this mean for marketers? For starters, it means that going forward, personalization and optimization should be considered in the same breath. As users start to see more and more of their world adapt to their history and interests, their expectations of companies will follow. You've got time, of course, but it's worth brainstorming now how a visitor's context will affect their experience on your site. How does their history with your company define their interests? What role does their industry or job title play in the content they choose to consume? All of this will increasingly become key to marketing effectively. Fortune-telling is more fun with a crowd. How do you expect SEO to evolve over the next few years? What is your company doing to evolve with it?